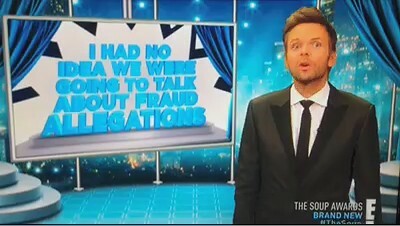 On April 3, E!’s Talk Soup handed out its prestigious 2013 Soup Awards, celebrating the best of the worst talk show clips from the past year. Now you’d suspect the group consisting of people “analyzing Apple” and the candidates for this award, who stand out by making jackasses out of themselves, would have some degree of overlap, but until this year that hasn’t been the case. Ladies and gentlemen: it is my distinct honor to introduce The Soup Award winner for 2013, in the category of “I Had No Idea We Were Going to Talk About Fraud Allegations”, Henry Blodget. I’m sure this was more about Henry wanting to come off as a lovable, smiling on-air personality when the camera light went on, but having to switch to “contrition mode” after Matt Lauer exposed Blodget as a blacklisted market manipulator. Another more fantastic possibility is that he legitimately didn’t see the intro coming and that Lauer’s words smashed into his ego with the force of a Mack truck. You can probably tell which one I’m going with. It doesn’t matter: one of the largest Douchebags in the Row just got a parody award for getting his beanbag stomped on the nation’s 2nd rated TV morning show. I guess this humiliation is going to have to serve in lieu of the fact that Blodget gets to keep fomenting as editor of a site called Business Insider – after the SEC supposedly banned him from the sector as the part of his settlement that didn’t involve millions of dollars. The Soup’s bit that follows Blodget’s Nazi face melt footage is just delicious icing on the cake. 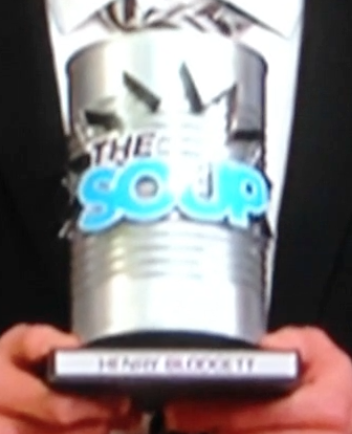 There’s one other nugget of bonus hilarity: The Soup couldn’t even be bothered to spell his name right on the award. Someone once told me there’s no such thing as bad press. I think we’ve just found the exception.